For those of you who have never seen speedway here is a clip for you. 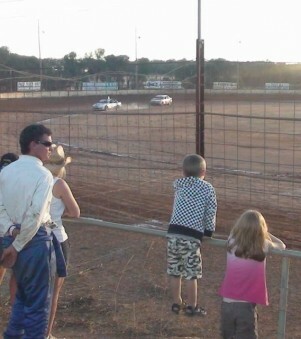 This is the start of the final, 20 cars doing 40 laps at Narrogin Speedway Club. The orange car out the front is Kye Blight who is the state number one already and is one of the local lads (and only 17). A very good driver and although he ended up sitting out most of the final he’s got plenty more chances to get the number 1 spot, and I don’t doubt that he will. I took the kids, who absolutely loved watching the cars race. I enjoyed catching up with blokes I used to race against and watching them race in the national title. Yes, it makes me want to go out and buy a car and start racing again, but it is an expensive sport…and I lack funds. The production division is the division I raced in, just about the cheapest after street stocks, which my dad still races in. After juniors, I went into productions at the age of 17 because dad thought it would be better as productions are allowed to have more bar work protecting the car (don’t think he liked the idea of lots of panel beating). There were a few crashes, one with a missing wheel, engine failures – but the kids loved the crashing the best. And I must say I was amazed at the turn out and what a great event for the Narrogin Club. The place was packed and cars were parked down the road outside the club. I even got to show my kids my name up in the club rooms on the champions board…not that they really cared or understood what it was for – LOL! You can see more about the speedway on their website.